Heat oven to 375°. Stir cookie mix, margarine, flour and egg until soft dough forms. Divide dough evenly among 3 bowls; tint each dough by stirring in a few drops of desired food color. For a variety of colors, make several batches of cookies. Bake 7 to 9 minutes or until edges are light golden brown. Cool 1 minute; remove from cookie sheet to wire rack. Cool completely, about 30 minutes. Spread frosting on bottoms of half the cookies. Top with remaining cookies. Place ropes side by side and a little more than 1/4 inch apart on floured surface; roll until 1/4 inch thick. 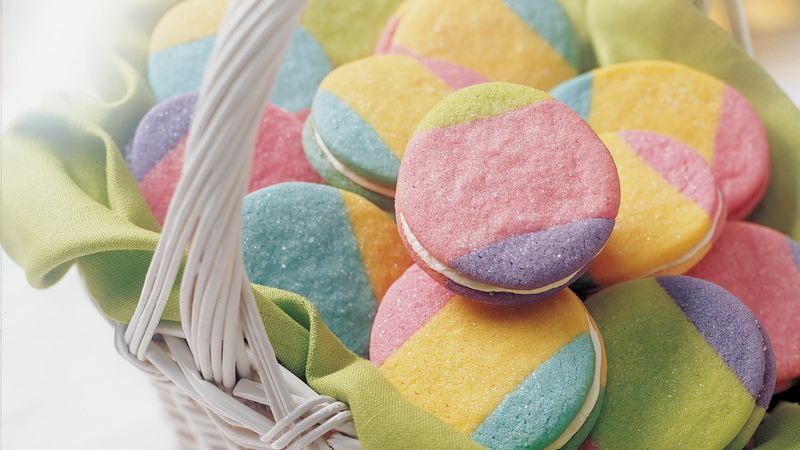 Cut with 2- to 2 1/2-inch egg-shaped cookie cutter so each cookie has 3 colors.